The shelves and counters of gas stations are quite literally bursting with shiny packaged bundles of un-healthiness. As quick, convenient and appealing as the likes of jerkies, sodas, cakes and confectionary may be, let's face it, your body is not going to thank-you for it in the long run and neither are those poor souls unfortunate enough to be traveling in the car with you when your gut begins its digestion process. Nothing ruins a road trip like flatulence and there'll be plenty of time to punish your body once you get to your destination and the car keys are packed safely aside. Besides, after you've gorged on these health-packed, energy-boosting treats instead of the fatty, calorific, salt 'n' sugar processed packaged temptations, we promise you that upon arrival, you'll be quite literally raring to go and ready for absolutely anything. Especially if you've lied to your wives and your road trip is destination Vegas, a la "The Hangover." GE's Freshpedition sent top chef Ben Sargent accompany GE engineer Justin Berger on a rather unusual cross country journey to visit wildlife biologist Ron Thompson. Their mission? To deliver Thompson with the finest of home cooked meals using only ingredients that they had picked up along the way. How on earth did they keep the food fresh we hear you ask? Well, they took one of GE's brand spanking new French Door Refrigerators along with them for the ride. 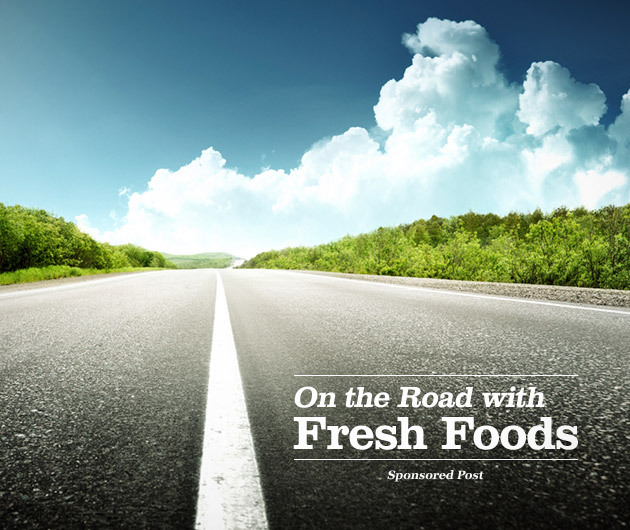 Now we realize that for most the prospect of attaching a fridge to your automobile is slightly beyond the realms of possibility, so here's a list of five of the finest, vitamin filled road trip snacks that do not require you to strap some kind of giant cooling system to your ride. Full of protein, not to mention a good chunk of your recommended daily calcium intake, and you don't even need to get out a knife to cut it. It’s quite handy when you should really have your hands on the wheel. A great way to fill your body with vitamins and of course an excellent source of hydration makes this perfect for those who can't be bothered with actually eating those crunchy treats. Tastes a hell of a lot better than water, but just make sure that you juice it before you set off. A no brainer really. If you can't see the benefits of this one, then perhaps you shouldn't really be allowed to possess that driving license. Ah, sandwiches, the possibilities are quite literally endless. Just make sure you swap the butter for margarine, or even better, opt for avocado for your spread. Brown or wheat bread too, obviously. FreshpeditionCompensation was provided by GE via Glam Media. The opinions expressed herein are those of the author and are not indicative of the opinions or positions of GE.